WEBINAR: Low Latency Wireless - What's Hot! If your trading strategies rely on speed, then you've probably heard that there's nothing faster than microwave and millimeter wave wireless technologies. The marketplace for these services is evolving rapidly, is difficult to manage, and is fraught with challenges. If you leverage wireless today or are thinking about deploying it in the future, there are 5 key things you need to know about the market for these dynamic technologies. 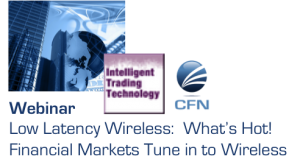 Listen to Peter Harris, Editor and Publisher of the A-Team Group, and Mark Casey, President and CEO of Apcela (Formerly CFN Services), as they discuss the 5 key things you need to know now about the next generation of wireless trading technologies. 1. All wireless networks are not created equal. What you don't know about underlying frequency congestion, licensing, and coordination can cost you millions. 2. There are more than a dozen companies offering some flavor of wireless transport. Find out who they are and which are best at what they do. 3. Leveraging wireless technologies for market data, signaling, or trade execution all face a different set of challenges. Learn how to identify and mitigate these hurdles. 4. Understand the buy versus build dynamic - along with the costs and challenges of each. 5. Learn how top trading firms are integrating these technologies to create Alpha.